Do Confessional Poets Forfeit our Right to Privacy? Last week I wrote a post about the sensitivity of performing confessional poetry given that it might violate the privacy of those people mentioned in the poems. Today I want to discuss how listeners tend to react to confessional performance poets, both audience members immediately following the performance as well as members of the press and academics. I was … Continue reading Do Confessional Poets Forfeit our Right to Privacy? Whether you collected every item in the Inky Fingers Literary Edinburgh Scavenger Hunt or not, please come to celebrate vibrate Edinburgh’s literary community! Between 2-5pm, teams who participated in the scavenger hunt can bring their collections to be officially recorded. Details about this will be provided when you register. 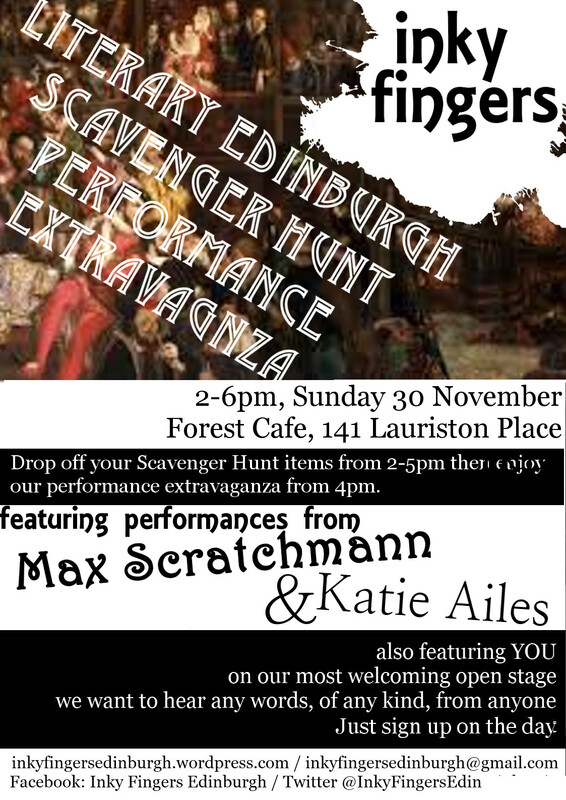 At 4pm, the Performance Extravaganza begins!